Somerset Grand Hanoi Serviced Residences The Somerset Grand Hanoi Serviced Residences enjoys a great location in the Hoam Kiem District of Hanoi. The Gia Lam Airport is only 4.50 km away and the Hanoi Railway Station is 0.46 km away from the hotel. The hotel provides clean rooms with ceiling to floor large windows, ensuite bathroom, and attached kitchenette. From executive studio to deluxe room with three bedrooms to one bedroom executive room, the hotel provides many room options to suit individual needs, budget, and preferences. There is a super market on the ground level with some restaurants serving less varieties of food. The entire hotel is equipped with free Wi-Fi. The friendly English speaking staff helps in arranging tours to the city and is always up and ready to meet guest’s expectations through their customer service. 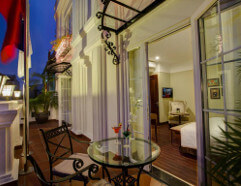 Hanoi La Siesta Hotel and Spa Hanoi La Siesta Hotel and Spa is a centrally located hotel in the old town of Hanoi. Its location makes it is a preferred choice for guests as they can visit the nearby local food joints and experience the local culture of Hanoi easily. The hotel is 3.54 km away from the Gia Lam Airport with rail stations, Le Duan Railway Station and Hanoi Railway Station only within 1.60 km. The hotel offers free Wi-Fi in all the rooms and exceptional services like cook-to-order breakfast, full serviced spa, and bicycle rental. 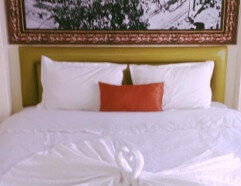 The 50 well-equipped guestrooms are clean, cozy, and provide utmost comfort to make the stay for guests unforgettable. The staff speaks English, Japanese, French and Chinese to cater to guests from western countries. Hanoi La Siesta Hotel Trendy Hanoi La Siesta Hotel Trendy is an opulent boutique hotel located in the Hoan Kiem district of Hanoi that offers luxury staying facilities to travellers. It is only 500 meters away from the St. Joseph Cathedral and 700 meters from the renowned Ngoc Son Temple. All the rooms come equipped with free Wi-Fi and modern facilities. The rooms are high on cleanliness and comfort. The hotel features a 24-hour front desk at the hotel with English speaking staff. Other facilities of the hotel include a cigar bar and wine cellar. Guests also love to visit its library /lounge. Noi Bai International Airport is about 21 kilometers away from this hotel. The best points of staying at the hotel include exceptionally warm staff that will take care of every need of their guests and delicious breakfast at the restaurant. 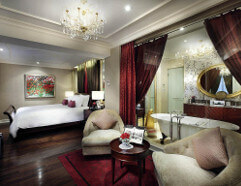 Essence Hanoi Hotel & Spa Enjoy extraordinary holiday experience at Hanoi with the Essence Hanoi Hotel & Spa. Located in the old quarter, guests can enjoy 3-star facilities at this property. All the elegant rooms have hardwood floors, wall paneling, soft lighting and stylish furniture. Besides, all of them come equipped with a television with satellite channels, free Wi-Fi, a safe, minibar/fridge and private bathroom with shower. This hotel is only a 5 minute walk away from the Dong Xuan Market and Hoan Kiem Lake. Guests can reach the Opera House and the Thang Long Water Puppet Show within a 10-minute walk from this hotel. The English speaking staff makes the stay comfortable and hassle-free. It is a great stay option if looking out at staying amid all the hustle-bustle and experiencing the local culture of Hanoi. Meracus Hotel 2 With close proximity to some of the popular tourist attractions in Hanoi, Meracus Hotel 2 is a fine accommodation choice. This hotel is 5 minute walk away from the well known Thang Long Water Puppet Theatre. Noi Bai International Airport is around 45-minute drive away from this hotel. All the guestrooms have air conditioning and hardwood floors and come equipped with a flat-screen television with cable channels, free Wi-Fi access, minibar, personal safe and a private bathroom with a standing shower and a bathtub. The hotel offers free fax services for their guests. There is an on-site restaurant, which opens only for breakfast and offers a variety of dishes to cater to different palates. The hotel offers value for money services with friendly staff to make the stay even more convenient. Essence Palace Hotel With chic and stylish rooms, the Essence Palace Hotel offers comfortable staying facilities to travelers to Hanoi. Located almost 21 kilometers away from the Noi Bai International Airport, this hotel offers an array of facilities for their guests. Each room of this property comes equipped with a flat-screen television with cable channels, free Wi-Fi, a minibar, electric kettle, safe and private bathroom with a hairdryer, shower and free toiletries. The hotel also has a shared lounge, a garden, terrace and a ticket service. Just approach the staff at the 24-hour front desk for any assistance and the staff will be more than happy to extend help. The hotel is almost 300 meters away from Ngoc Son Temple while the Old City Gate and Hoan Kiem Lake are only 500 meters from it. Located about 21 kilometers away from the Noi Bai International Airport, travellers can enjoy stylish and elegant accommodation in the beautifully appointed and air conditioned rooms of Hanoi Guest House Royal. Each guest shall appreciate the Victorian-inspired décor of the rooms of this hotel. Each room comes equipped with a smart television, electric kettle, minibar, safe and en suite bathroom with a hairdryer, shower and availability of hot water. The friendly and English-speaking staff of the hotel makes the stay of their guests even better and comfy. 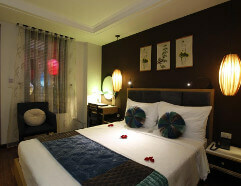 Eclipse Legend Hotel Eclipse Legend is a conveniently located hotel in Hanoi with friendly and helpful staff. Nestled almost 400 meters away from the panoramic Hoan Kiem Lake and the Ngoc Son Temple, this hotel features a restaurant, bar, a front desk and tour desk. The rooms of this property are air conditioned and come equipped with a large comfy bed, a television, a personal safe, a wardrobe, a minibar and an en suite bathroom with a hairdryer, shower and toiletries. Noi Bai International Airport is about 21 kilometers from this property. Guests can approach the tour desk to arrange sightseeing trips. Seek assistance at the front desk of the hotel for luggage storage, laundry, ironing and airport pickup and drop. The breakfast offered is not elaborate but tasty enough to keep the guests satiated and happy. 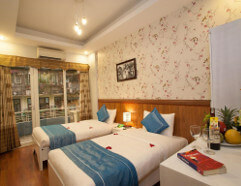 Hanoi Brother Inn Hotel Hanoi Brother Inn Hotel is a conveniently located hotel as it is only 1.5 km away from the city center. The Gia Lam Airport is located 4.15 km away while the Le Duan Railway Station is only 0.82 km away. Guests here can enjoy good facilities and services like free Wi-Fi in all rooms and public area, babysitting service and family room for families with kids, and English speaking staff. In addition to these facilities, other convenience services offered are concierge, library, room service, airport transfer, shuttle service, luggage storage, and rental car. 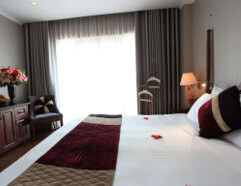 The hotel offers clean rooms and good quality services in the reasonable price offered. If clean rooms, economical rates, comfort, and friendly staff is on the list, then Hanoi Brother Inn Hotel is a good choice. Hanoi Tomodachi House Located in Hoan District, Hanoi Tomodachi House is a budget hotel with excellent services and amenities. The hotel is 4.61km away from the Gia Lam Airport and Le Duan Railway Station is only 0.25 km away. The hotel offers 20 clean rooms with shared dormitories for males and females and separate rooms for families and couples. Because of its prime location, the hotel is closely located to some of the popular attractions such as Thang Long Water Puppet Theatre, Temple of Literature, Ho Chi Minh Mausoleum and Hoan Kiem Lake, all within 15 minute of walk away. It is a convenient hotel to stay at as it offers free Wi-Fi across the hotel, free cooked-to-order breakfast, and free toiletries. The helpful staff is always ready to go extra mile to help out the guests and make their stay home-like with their exceptional amiability and service. 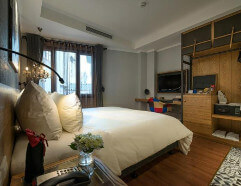 Box Hotel Hanoi Box Hotel is a strategically located hotel in Hanoi with a wide range of facilities. The hotel is almost 20 kilometers drive from the Noi Bai International Airport. With a convenient location, guests can easily access some of the popular tourist attractions in the city. The Old City Gate is only 200 meters from the hotel while the Dong Xuan Market is approximately 300 meters away. The famous Ngoc Son Temple is about 600 meters from this accommodation. The hotel has 109 simply furnished and cozy rooms with modern amenities. 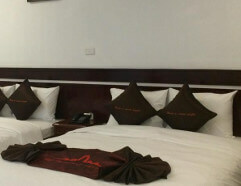 Other facilities in the hotel include a restaurant, a 24-hour front desk, free Wi-Fi access and a common lounge area. The staff is friendly and capable of speaking English and makes the stay of their guests comfortable and enjoyable. It is a good budget hotel with high-quality facilities available at value-for-money prices. New Airport Hotel Located at Noi Bai, New Airport Hotel is a good choice for travellers who search comfortable accommodation in Hanoi. The hotel is only 3 kilometers away from the nearest Noi Bai International Airport and 9 kilometers away from the famous Thanh Chuong Palace. Guests can enjoy free Wi-Fi access throughout the property. The hotel also offers free parking facility on site. It has 28 beautifully appointed rooms to offer comfortable and relaxed accommodation to travellers. Other facilities of the hotel include a restaurant and bar. The region where this hotel located is famous for cycling and fishing. The hotel offers bike and car hire as added services. 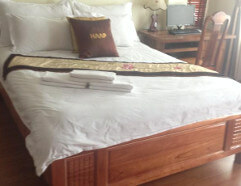 HAAP Viet Travel Homestay HAAP Viet Travel Homestay offers affordable accommodation facilities to travelers to Hanoi. This conveniently located hotel is only 3.1 kilometers from the Noi Bai International Airport. Travellers have an easy access to some of the popular attractions in the city. The renowned Thanh Chuong Palace is about 8 kilometers from this property. The homestay offers 8 well appointed rooms with best amenities. It is a preferred accommodation choice for many travellers because they allow pets inside. Some of the common facilities of this homestay include an on-site restaurant, free Wi-Fi access, a 24-hour front desk and free parking. The area is famous for biking and this homestay offers bike rental for the convenience of their guests. VATC Sleep Pod Right inside the airport, it is convenient and easy for travelers to reach VATC Sleep Pod. Located at Terminal 2, it is a capsule accommodation with 6 capsules ideal to relax and enjoy uninterrupted sleep. All of them come equipped with basic facilities. Guests can reach the well known Noi Bai International Airport with a few steps. This hotel offers free Wi-Fi access throughout the property. The hotel also offers free shuttle service for their guests. The staff can speak English and provides impeccable service to make the stay of their guests comfortable. It is a good stay option for business travellers seeking for a good sleep before taking the next flight. Noibai Family Homestay With plenty facilities, travellers can find excellent staying facilities with the Noibai Family Homestay. Located in the Noi Bai area of Hanoi, this home stay is 1.9 kilometers away from the nearest Noi Bai International Airport. 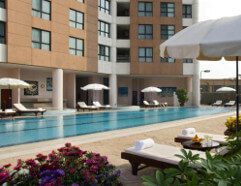 This property has 16 well furnished rooms with modern facilities. Thanh Chuong Palace is almost 8 kilometers from this homestay. The homestay also has facilities like an on-site restaurant, free Wi-Fi access and free parking facility. It also provides a hairdresser at the property. The staff is super-friendly and helpful and travelers can enjoy a home-away-from-home atmosphere with Noi Bai Family Homestay.